Short and simple today, I’m going to talk to you all about the future plans for this website, along with what I’m doing to realise these plans. As such, it’s not an article on anything particularly geeky, although you will get to read about what I do in the background. There’s a lot on the way and there’s not much left in the year 2016, which has been a truly phenomenal year for GeekOut South-West and it’s been, shall we say interesting in the wider world as well. Oh yes, the subtitle above isn’t a joke – I’ll be releasing an eBook soon, which will be completely free to all of our readers. This will be a limited offer, which will be around for one month only. I hope to have the eBook ready in January, which will coincide nicely with another announcement which I’ll explain shortly. The eBook in question will be a series of short stories based in the world of Anathor, the hazed world. Everyone who is already signed up to this website will automatically get a copy of The World Haze: Collection One. Hopefully, this should be ready in January 2017, but it might be a little bit later, depending on demand for the other bits that we’re working on. So, what else are we doing..? Our forums are a work in progress. I love this website, I really do… But as time has gone on, we’ve filled our media space so much that we need to begin to think about what to do should we run out of storage. That’s not all: The website, whilst functional, isn’t very interactive. It’s not very interesting any more and in all fairness, I don’t think it’s fair on all of you to just click to read an article and that’s the end of that. We want interactivity, we want to speak to you all in a more meaningful way. We want you all to be able to add your own articles, under specific conditions. We want to share information and we want to provide a space for everyone to talk about their passions. We want to chat with you. We want you to chat to us. We want to create a functional, friendly, fun forum. 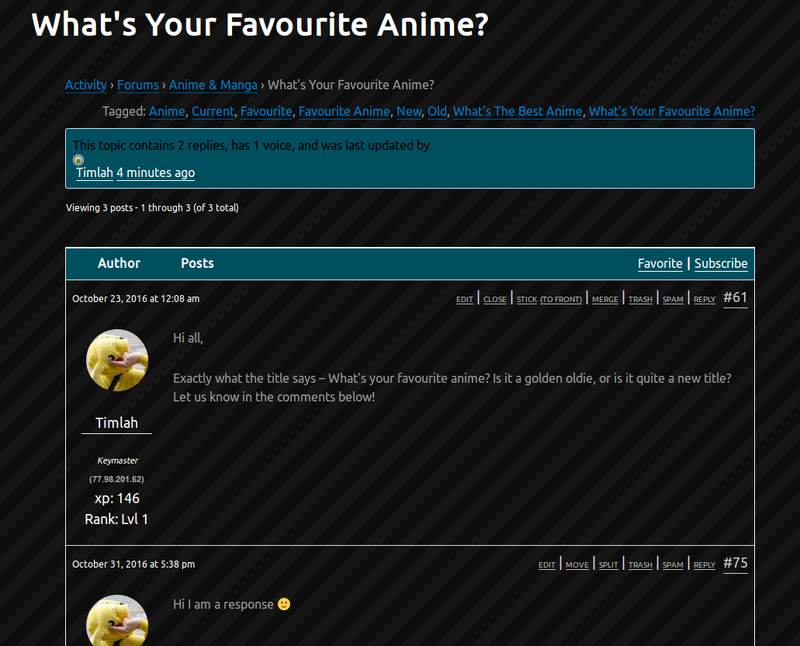 The screenshot above is a snippet from the test of the forums. It’s not perfect yet (I mean, look at those response numbers), but I’m working on that! We want people to share their favourite conventions with us, to tell us stories of the conventions and what they think is good and bad about them. No more “list websites”, it’s time to create the ultimate resource for the UKs convention scene. After all, I’m surprised no one’s done this before. We’re not abandoning our writing: We’re extending what we’re capable of. We want to be so much more – and we want all of you there for the ride. Expect an email over the coming months, inviting you to join us in our new GeekOut UK website. That’s mostly what I wanted to tell you today, but there’s a third, very secret project I’m looking into at the moment. I’m a huge fan of everyone who reads this site and I seriously love the discussions we’ve had. If you read but never comment, don’t worry – I appreciate the fact you spend the time to read. But what do you think of my two announcements? I’m always open to your opinions and discussions, your thoughts and your experiences. As always, leave a comment below, or over on Facebook, Twitter or Reddit. Once again, I’d just like to say a massive THANK YOU for every time you’ve clicked a link on this website. I hope the new GeekOut UK will be bigger, better and more adventurous than ever before. This entry was posted on November 7, 2016 by Timlah. It was filed under GeekOut discussion and was tagged with eBook, Free eBook, Free Fantasy eBook, Free Short Stories, Geek Forums, GeekOut South-West, GeekOut UK, Geeky Forums, New Website, Short Stories, The World Haze, The World Haze: Collection One.